Description on Can: Authentically British, from its bespoke tailoring, to its superb craftsmanship, most defined by its world champion character. Classic English dry cider from English bittersweet cider apples. Opinion: First impression is the amount of sparking when poured into the glass, and the deeper amber color, more so than many ciders. For some reason this really reminds me of semi-dry oak aged ciders, such as Schilling Oak Aged, although this is not barrel aged. I pick up a light earthy oak flavor. Even though this was drier, it was still very drinkable even to my palate which prefers sweeter ciders. I wouldn’t call it a fully dry cider though, as I have had a number of ciders which were more dry, even when usually trying to avoid them. It starts out a bit sweeter (with an almost caramelized sugar type flavor) and finishes a bit drier, with the bittersweet apple flavor coming through. I wouldn’t however call it overly tart, which I have picked up in some drier ciders. I’m surprised how much I like this one actually! This is quite different than Crispin’s other selections, which vary from their fairly plain Original, to plain & blackberry pear varieties, to their Artisanal Reserve line. I’m curious how closely this actually resembles a traditional English Farmhouse cider, because if it does, I’m a fan! Have you tried Crispin Browns Lane? What did you think? ← Cider Cocktails for the Independence Day Holiday, Anyone? Love Crispin’s Brown’s Lane, however this summer something changed. There is a weird chemical after taste and a smokey “flavor” that it hadnt had previously. Do you know what happened? No, I haven’t heard anything (nor have I bought any more since my review). However, in general, ciders can change batch to batch, due to everything from the apple crop to ambient temperature at fermentation to how long it sat on the shelf at the store. They may also tweak recipes. Plenty of times I’ve loved a cider the first time around, but it was completely different when I bought more. Usually commercial ciders have less variation due to the processes they use and blending. 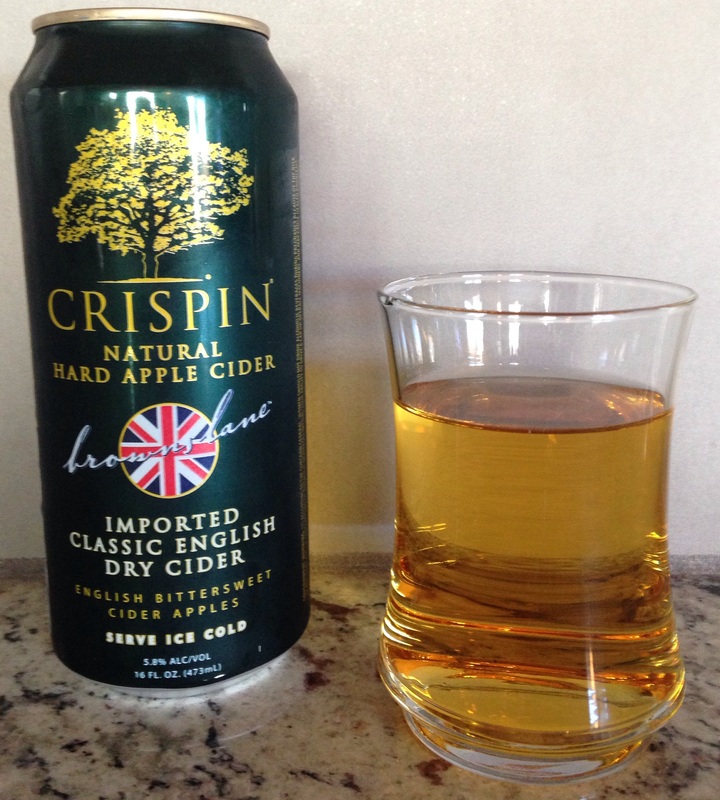 If you like Crispin Brown’s Lane, you should try to find some other English cider imports. They can be surprisingly adfordable compared to local craft cider. Look at high end bottle shops, such as those who sell single bombers of beer (or depending on your area, a wine shop…sometimes cider is grouped with beer and sometimes with wine). Some of my favorite brands are Sheppy’s, Aspall, Dunkertons, and Worley’s. French cider (especially from Brittany, not Normandy) is another favorite of mine. Cheers! I just tasted this for the first time, and quite seriously it is disgusting. Tastes like old socks. As a celiac person I know my ciders, and this one is gross. Hi! Thanks for reading, and sharing your experience. Everyone definitely won’t like every cider. There is also a possibility it could have gone bad (that is a higher probability for imported ciders due to the time they spend in transit, at varying temperatures, plus they tend to sit on the shelf at the store for longer as they aren’t as popular). However, I’d also like to point out that English cider has some different qualities than a run of the mill American cider you’d pick up in a six pack. They can have tannins (they dry the mouth – the same type as are in red wine), bitterness, and funk (the most likely culprit for an “off” scent or flavor). Oddly enough, all three of these qualities are things that someone can learn to enjoy over time. Another cider characteristic which can be initially off-putting is when a cider is sour (different from tart), but that is most common with Spanish cider. I’ve had some ciders that I would have sworn had gone bad, but turns out that was just the style, and intentional. I’d encourage you to keep trying ciders, and try to read up on them to get a better idea in advance as to whether you are likely to enjoy the cider.